New York, NY (June 12, 2014) – Making its mark as one of very few romantic dramas with a strong message of faith, LoveLight Pictures presents THEFATHER’SLOVE. 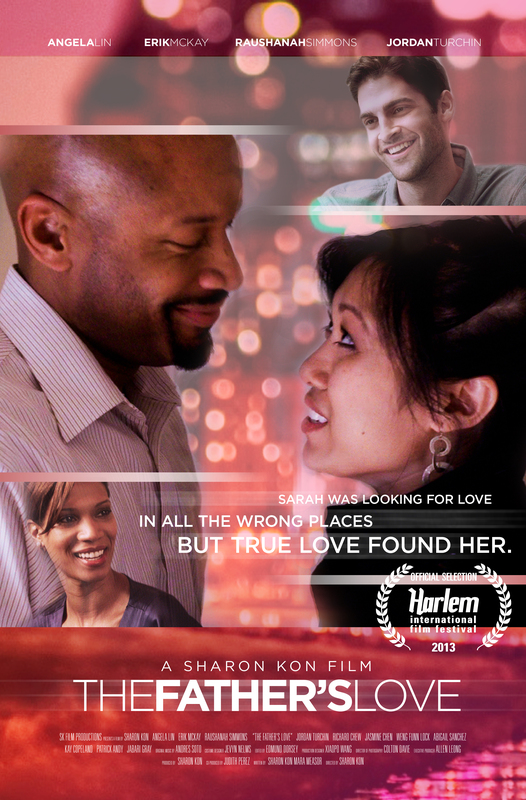 Releasing in select theaters through TUGG in August 2014, this new independent movie stars Angela Lin (Person of Interest, Blue Bloods, Grey’s Anatomy, Chinglish, Wallflowers) and Erik McKay (All My Children, The Situation, Thicker Than Water). It aims to provoke men and women to value love and honest relationships. unfolds Sarah is taken on a journey of heartbreak and forgiveness, while exploring the meaning of her relationships both past and present. She soon realizes the impact her father made on her as a child and struggles to let go of the hurt she experienced. Sarah’s best friend, Tricia, (Rashaunah Simmons – Law & Order: SVU, The Other Woman, The Blacklist, Hostages) encourages her to look deeper for that unconditional love that only comes from God. When Sarah does, her world begins to unfold in a way that she could never have imagined. THEFATHER’SLOVE will touch the hearts of those who have experienced painful relationships and for those who have severed relationships with their earthly fathers, as well as their Heavenly Father. This movie is an emotional rollercoaster ride that ends with the message that no matter what, there is always hope waiting. Writen, Directed, and Produced by award-winning filmmaker and owner of LoveLight Pictures, Sharon Kon (Ultraviolet), THEFATHER’SLOVE is based on Kon’s own personal experience in an effort to help other women, who have been through similar situations. Kon was recently awarded this year’s Excellence in Service Award at the Christian Women in Media Association’s (CWIMA) Annual Awards Gala in Dallas alongside of Executive Producer and Actress, Roma Downey and Film Critic, Publisher of Movieguide®, and Chairman of the Christian Film & Television Commission®, Dr. Ted Baehr. Kon was also named Regional Director of CWIMA’s New York Metro chapter. This successfully crowd-funded film has garnered support via individuals, organizations, and churches. Riding the new wave of faith-themed movies, THEFATHER’SLOVE, will hit the big screens in August 2014. Using the popular TUGG to reach theaters across the country requires the involvement of a community who longs for good quality movies that encompass much of the human experience and emotions. Those who are interested in being part of this new wave of quality faith-based films can connect with THEFATHER’SLOVE movie and team up to bring this exceptional quality Christian message to communities across the nation. They have the opportunity to bring this captivating and enduring story of faith and forgiveness found, to their own local theater. About LoveLightPictures: LoveLight Pictures is a dynamic and multi-faceted New York City-based company that produces quality documentaries, feature films and corporate communications. Our objective is to create and develop programs, upholding a level of quality, creativity and innovation that matches many of today’s most popular programs. Projects are purposed to educate, inform, enlighten and entertain in a fresh and positive way.